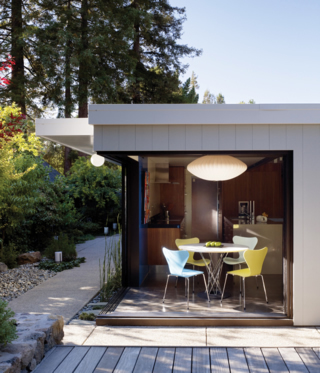 When Anne and Mike Cisson retired and downsized to an East Bay Eichler, they knew that living in a smaller space would demand a multi-functional kitchen. 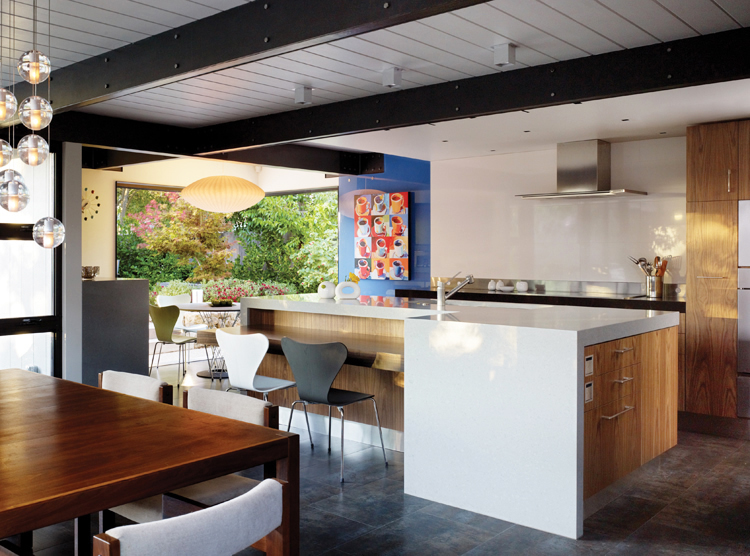 Through a whole-house remodel, the couple worked with architect Lourdes Garcia and Stephen Steele of S&Z Construction to create a kitchen that was open and low maintenance and blended well with the home's MCM architecture. In the original atrium-model layout, the only way to communicate with guests and family between the kitchen and living room was to talk through a small pass-through. There was a danger, the Cissons say, of banging heads on the upper cabinets, and the storage and lighting were inadequate. 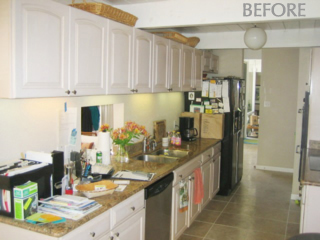 The remodeling team began by opening the kitchen area to open-plan dining and living areas. The Cissons also replaced the old laundry room, formerly wedged into the back corner of the house, with a bright and airy breakfast nook. Fully retractable, quadruple sliding Fleetwood doors open the corner of the kitchen to the outdoors, with or without screening. "You've heard this before, but the best part about living in an Eichler is bringing the outdoors in," Anne says. A scullery, separated from the main kitchen with a 3Form translucent slider, provides a separate space to set the dirty dishes when entertaining away from guests' view. The divider, which is also replicated between the scullery and a laundry room, lets light through but keeps sound out. 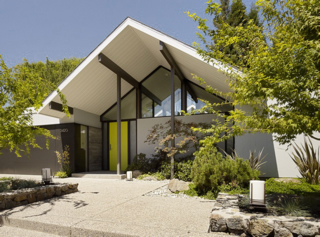 The individual tasked with the dirty work of cleaning up can enjoy a wall-to-wall view of flowering dogwoods out the window, or the cool air by opening it, and even turn on the radio or music without disturbing anyone in the main room. Dish drawers are just inches away from the sink and dishwasher, making loading and unloading a breeze. The Cissons also housed the coffee bar and espresso maker in this area. The cabinet design is all about function. Pullout pantries organize and divide the space and provide plenty of storage. There are towers for baking and prep, food storage, cooking, recycling, and cleaning supplies. Small appliances are also tucked away but easily accessible. Aesthetically, Anne wanted cabinetry to be free of hardware for the cleanest look. Ceasarstone-wrapped countertops and Porcelanosa tile complete modern look and are easy to maintain. Mike says he inspired the addition of a 32-inch flat-screen television and a countertop wine bar, complete with a Subzero wine refrigerator, that provides ample serving space for get-togethers. A table-height wood-slab countertop by the prep sink area also promotes camaraderie. "Since I am not a demonstration cook, I did not want something higher or lower," Anne explains. "As we age, our friends are also getting older, and some of our friends just can't stand for long." Design: Garcia Studio Architects, Inc.